Khan, I mean Arctus Baran, continues doggedly attempting to track down some unknown artifact. He attempts to pit Picard and Riker against each other, not knowing that they are actually allies from the Enterprise. Picard finds the artifact that Baran is looking for, but is suspicious about its nature. The crew of the mercenary ship gets on board the Enterprise to steal another piece of the artifact, then flees toward Vulcan, where the artifact is supposed to work. Once there, however, Picard is able to overcome the device’s power as a weapon by remaining serene. Okay, there is way more to the plot than that but I figured I should probably not have the summary take up half of this post. 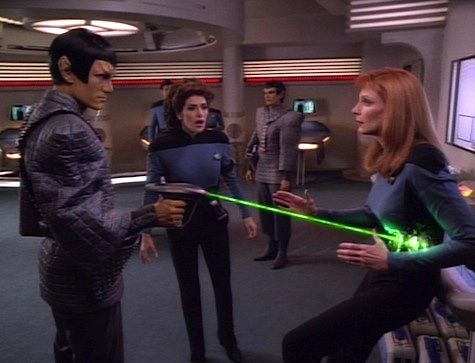 The Vulcan weapon is surprisingly… logical. (Sorry.) But really, it kind of makes sense for them to have created a weapon which would only act against hostile enemies. It also was neat to get another piece of history about the Vulcans, who have been largely untapped in their potential throughout TNG. The climactic confrontation between Picard and the Vulcan/Romulan (I can’t remember which, it was all too convoluted) was a little silly, though. Yes, the weapon makes sense for a Vulcan to have made it, but the way the scene was portrayed was much campier than TNG tends to do. This is an episode that would fall apart if pressed on the edges too hard. There are several parts that don’t make a lot of sense, but it is also one of those episodes that manages to be so much fun to watch that as a viewer I didn’t much care about the holes. I mean, these are basically space pirates, right? But they’re not just space pirates; they are space pirates who go about seeking out booty that is archaeology. I was a social studies major in college and I gotta say it doesn’t get much cooler than that. Data is having dreams again, and they are getting weirder and weirder. Indeed, they begin to impinge on everyday reality for him. There doesn’t appear to be any explanation for these nightmarish turns in his dreams, and he goes to the holodeck to talk to Sigmund Freud about them. It turns out that there was no help there, either. It turns out that the nightmares and Data’s odd behavior were caused by some correlation between creatures that were clinging to the different crew members. I gotta admit that part of the reason I didn’t enjoy this episode as much as I may have otherwise was Sigmund Freud. I think he was a bit of a quack, myself. Of course, this episode makes him look a little bit like a quack, so maybe I should have liked that part more… and hey he did help develop psychology as it stands today. Oh well, I still thought that part was just weird. Weird? Yeah, this episode was surreal. It was never creepy, and it didn’t really push the boundary so far as mystery was concerned either. It just felt… strange. That was the main problem with this episode, really. There wasn’t enough here to get a strong feeling of mystery, nor was there as real a sense of foreboding as there has been in other episodes that focus so much on the strange. I don’t know if I’m conveying this as well as I would like in this review. It’s one thing to be weird in order to have it shrouded in mystery, or to throw the viewer off and make them uncomfortable in a kind of horror type experience. But this was just off-putting. Especially Troi as a cake. It did, however, give a sense that there are probably more awful things out there in the universe that the crew of the Enterprise has yet to encounter. It was surprising to me to see the wide grade difference between my wife and I. Apparently she liked the weirdness more than I did. La Forge’s mom–a Starfleet captain–is missing, but La Forge presses on to complete a mission in which he controls a drone through an interface that hooks up to the same place his visor does. The mission is to recover some information from a wrecked Starfleet vessel. Yet, as La Forge goes through the derelict, he sees his mother asking him to lower the ship to the surface to save the missing crew. Ultimately, La Forge and Data work together to do so, but it turns out that some sort of flame being was masquerading as La Forge’s mother, and she is still missing–though he did save the fire beings. LaVar Burton picked up this episode, strapped it onto his shoulders, and carried it across the finish line. I say this because it was pretty much his acting alone which saved this episode from the garbage heap. It was only because I felt that La Forge was experiencing a real struggle that I could even begin to suspend disbelief long enough to enjoy the great character portrayal he put forward. And he sure nailed it. I can’t say enough for how well-acted this episode was on Burton/La Forge’s end, because without it, we would have had a poor episode at best. There are a lot of problems with this one. First, how the heck is a probe that looks like a floating cylinder in any way parallel to a human walking around and interacting with the environment? Okay, I get it, they used tractor beams. But then, why do they need to have him walking up stairs or adjusting the interface so he can control his limbs? Am I supposed to believe that they just have tractor beams that work like limbs for some reason? That would seem incredibly limiting. Second, why is La Forge so gullible about his mother? I get that he is experiencing grief, but clearly something more was going on, and he just went with it. So I suppose my final verdict would be: great La Forge acting; weak plot and execution. Picard is missing and the crew finds a witness who says he was vaporized–and Troi says he’s telling the truth. Riker is filled with anger and decides to try to track down those who did Picard in. They appear to be some kind of pirates or mercenaries who are raiding archaeological sites. Riker is captured at one of these sites and brought on board the mercenary ship, implanted with a pain inducer, and forced into service of the crew. Yet, it turns out that Picard is there… alive of course! Picard has infiltrated the crew and tells Riker to go along with it. The episode ends with Riker taking shots at the Enterprise. Let’s get this out of the way: Arctus Baran, the commander of the mercenary ship, is Khan. He looks just like him. Seriously! Okay, so he isn’t supposed to be Khan, but I could totally see them just saying it is him. Oh well. This is a great opener for a two-part episode. There’s plenty of action and mystery here, which is what two-part episodes often need to keep viewers hooked. I like the archaeology in the episode–it helps give a sense of robust history behind the show that isn’t always there. Baran makes a solid villain, even if he isn’t actually Khan. The motivation goes beyond a typical X-is-evil shtick, so that makes it intriguing as well. Sure, he is motivated by money, but there is more going on behind the scenes in this one than some episodes have had. The scene in which Data dresses down Worf is particularly poignant. It shows the tension that could be in place on board a ship that has lost some senior officers. It was a great scene that illustrated how seriously Data took his position, and how Worf reacted to the changes as well. I loved it. The opener was also a great scene, as the various crew members attempted to get information at Mos Eisley Canti… I mean, a random space bar. It had just the right mix of cheese and seriousness that happens when the actors are firing on all cylinders. Someone predicts the end of a galactic empire by using math, but you won’t care because the characters are paper dolls. I couldn’t track down the copyright information on this, but it is a pretty awesome cover for the epic novel. I love Ben Hur. It is one of my favorite books of all time. I got into it after I fell in love with the 1959 movie, which is my favorite film. I also enjoy audio books quite a bit. I got this one for Christmas last year and finally managed to find the time to get through the whole thing. I wanted to post a review of the audio book because it is difficult to find one that actually reviews the audio book rather than just the book, which is of course excellent. I felt it was warranted because those who enjoy audio books often wonder about the quality of those they are looking to purchase, which can vary wildly depending on how well the reader(s) invests him or herself into the characters. Thus, this is for you, fellow audio book lovers. Lloyd James reads the book [in the version I’m reviewing], and his voice is quite good for the reading. He does do a few different voices depending on the character. These become fairly recognizable, though he doesn’t have quite the range of Jim Dale (see his phenomenal readings of the Harry Potter books). However, Ben Hur, Simonides, and other major characters are distinct in how they speak. 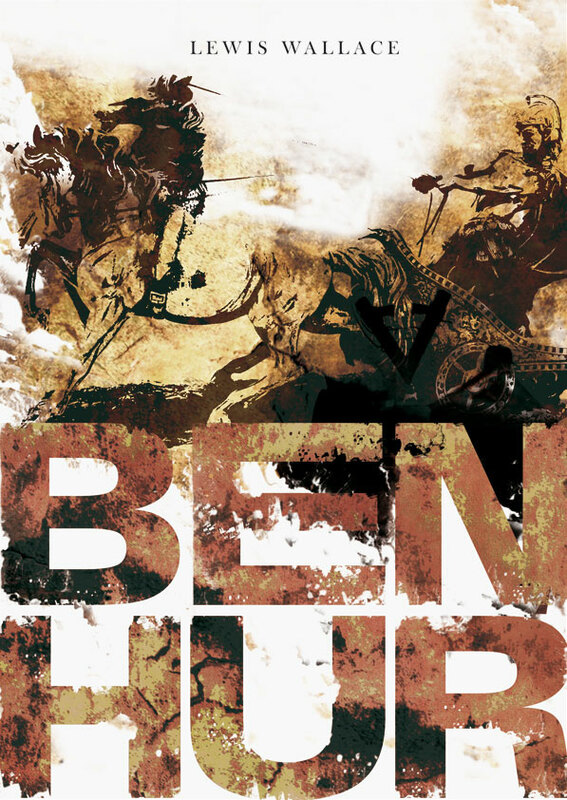 James sounds about the right age for Ben Hur himself, which lends some credibility to the reading. The recording is generally excellent as well, with no shifting volume between tracks. (That is, there are no portions I could tell where it was louder or quieter than the rest of the book, such that I had to mess with the volume.) It is steadily recorded, with track breaks at around 3 minutes on the dot every time. It runs about 24 hours and spans 19 discs. I do have two problems with the recording, which are fairly minor compared to the whole recording. First, about an average of once per disc, there is a skip in a track. It’s seemingly random and it really just splits one word in half. I noticed this both on the CD and in the same place on my iPod, which suggests that the skip is in the recording. I never felt it meant I didn’t understand what happened, but there was at least one of them that seemed to leave out a word. The other problem is that there are a very few (I can only remember about twice where it happened) times where James’ voice sounds quite tinny, as though he was too far away from the mic. This only happened for about 2-3 seconds each time I heard it. The discs are in three separate booklets, which are of average quality. The discs slip out if you hold the booklets upside down, so if you take them in the car you’ll want to make sure to store them safely. Overall, I’d highly recommend this audio book. The only downside is the occasional skips in the reading. The book is phenomenal, of course, and the recording does it justice. James did a great job reading the book, and I thoroughly enjoyed listening to it. Lore and Data are working together towards Lore’s dream: creating a pure race of non-biological life. Lore happened upon the Borg ship that Hugh returned to in I, Borg and gave them this purpose. However, Hugh is also on the surface and is leading a band of renegade Borg who oppose Lore. Riker and Worf work with Hugh to rescue the imprisoned members of the crew. Ultimately, Data must make a choice about whether to assist Lore to keep his emotional capacity or fight him and choose his friends. He ends up deactivating Lore permanently. Well, we’ve finally taken care of Lore. It’s about time! It’s unfortunate that Data’s brother had to be so bad, but it has been equally unfortunate that they haven’t already deactivated and dismantled him. Although, I wonder how Starfleet felt about dismantling an android–which is supposedly a person, after all. Let’s just go ahead and dissect this person who could just be reactivated. Was there a trial? Does Starfleet have the death penalty? Are my speculations getting out of hand? ANYWAY… “Descent Part II” is an enjoyable episode. Hugh showing up again was a great treat, though they clearly had too much going on to explore his character as much as I would have liked. What happens to Hugh next? I’d love to see a follow-up episode. The story was great too–it is always fun to see Lore and Data interact. However, the same problem that plagued the last episode is in this one: it is difficult to believe Data would just turn on his own people in any serious way over emotions. Overall a solid way to start the season. Three Iyaaran ambassadors visit the Enterprise, on missions to come to mutual understanding with Starfleet and learn more about each other’s culture. Two remain aboard the ship, while another departs with Picard and crashes on a planet en route. 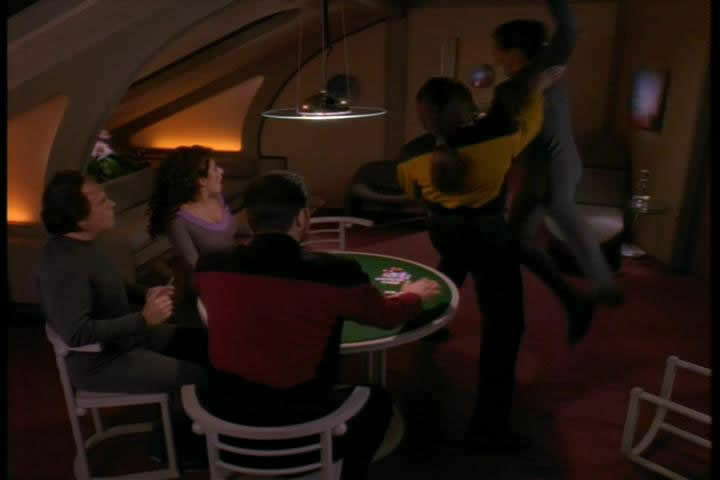 On board the ship, one Iyaaran appears only interested in eating yummy food, while the other continues to jab at Worf. On the planet, Picard discovers a woman who has been stranded for 7 years. Worf and the Iyaaran get into a fight, which remarkably ends when the Iyaaran thanks Worf for showing him anger. The one whose been feasting the whole time thanks Troi for showing the nature of pleasure. Picard figures out the “woman” was actually the third Iyaaran in disguise, and that he was trying to experience love. The diplomatic encounter is successful, though it leaves everyone a bit nonplussed. I loved this episode when I was a kid, which I’m sure influenced how much I liked it now. Really though, this is a fun episode. The plot is fairly thin, yes, but it is full of hilarious moments. Worf’s interactions with the Iyaaran were particularly epic (more on that later), but Troi also had her moments. The mystery surrounding Picard’s circumstances was also highly interesting, and it is fun to see him figure out what’s going on. You can tell he’s suspicious almost right away, which contributes to me believing the episode is possible. Picard isn’t an idiot, so it was good they didn’t portray him as such. But he didn’t figure out what was actually going on until much later. Worf had some epic lines in this one. “I will take him by the throat and rip out his esophagus” was probably my favorite. But yeah, Worf’s first stint as diplomat did not go so well. Or, maybe it went supremely well because he did exactly what the alien wanted him to do. Yeah, let’s go with that. Overall, I’d say I was right to enjoy this episode when I was a kid. It’s just fun all around. Captain Picard, Counselor Troi, Commander Data, and Lieutenant Commander La Forge are on a runabout (fancy shuttle) heading back to the Enterprise when they notice something is wrong: they are experiencing strange temporal distortions that shift between stopping/slowing time and speeding it up. They eventually make it to the Enterprise, but it seems to be trapped in time in a battle with Romulans. As they explore the ship, they see various members of the crew in situations that appear to be under attack. However, as they look more closely, it appears the Enterprise is attempting to assist the Romulans, not under attack by them. It turns out that the Romulans managed to get some time-travelling babies in their warp core, which led to all the distortions. The four crew members work together to set everything aright. Beth, my wife, pointed out that the people selected are basically the top 4 that you would want to have solve problems. Picard is just an all-around problem solver with lots of general knowledge; Data has lots of concrete knowledge, though perhaps doesn’t score so highly on “street smarts”; Troi would give you insight into people’s states and the ability to sense life forms, along with counseling issues and figuring out people; La Forge is, well, a genius and basically will MacGyver any problem. You could argue that trading Picard out for Crusher might not be a bad idea, because they have enough general knowledge with Data to offset the loss of Picard, but his leadership might be missed. Anyway, long story short this is a great set of four characters to drive an episode. What makes this episode particularly compelling is the way that we as viewers are made to evaluate the situation from the perspective of Picard and crew. We enter into their shoes, trying to discern what’s going on alongside them. We do, however, have the advantage of knowing the Enterprise was responding to a distress signal from the Romulans. Although Worf doubts that they should help, we have little reason to think that they turned around and attacked the Enterprise. The main place this went astray was in just a little bit too much of deus ex machina. The episode didn’t actually need some kind of weird beings from another time-space continuum. It could have just as easily had something get generated accidentally by the Romulans’ ship, and then we wouldn’t have had to deal with the strangeness of the solution that was ultimately offered. Oh well. It was still a fun episode to watch. The Enterprise investigates an outpost only to find that the Borg have attacked. When they fight, they see the Borg displaying emotions–and even Data experiences some emotions. They manage to capture one of the Borg, who challenges Data to confront his own pleasure in the emotion of anger and his desire to do anything just to get any emotion whatsoever. They trace the Borg ship back to a planet, trailing behind its trans-warp jump. When they investigate the planet, however, La Forge, Picard, and Troi are captured by the Borg, who are now working with Data… and Lore. The hardest part to believe about this episode isn’t the crazy Borg behavior, rather, it is how readily Data embraces the lust for violence just so he can have feelings. It just doesn’t go along with what we know about his character, and given that they’ve worked so hard to convince us he is a person, it is difficult to think that his past decisions and perspectives could so easily be overturned by manipulation of emotions. Sure, he’s not had emotions to deal with, but it is still difficult to swallow how completely he is willing to toss everything out the window. This is a good set-up episode, though, clearly putting a bunch of balls in the air. Any time the Borg are involved there is a serious question about whether they’ll be stopped–and to have them act erratically ups the tension a bit. How many yellow-shirts will be killed in the two-parter (and have yellow-shirts become the new red-shirts)? Has Data really gone over to the dark side? Why is Lore the worst? Finally, will we at last get to see the phaser rifle get used? The question is whether they’ll be able to wrap it up in any kind of satisfactory fashion. Also, can we take a moment of thanks for the fact the writers are taking Troi more seriously? Her discussion with Data about emotions was about the best conversation she’s had in the entire series.